Adopted special high quality cast iron which maintains high rigidity. Enlarged the upper part of each column for stable and precise machining. Precise positioning determined by a curvic coupling system. Implemented an ultra precise linear scale on all (X,Y and Z) axes. High ridigity and long traverses at each axis. Strong powers enough for wide and big working pieces. Approved rigidity and accuracy of machine. Equipped with chip guard with a full width. 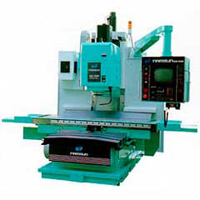 Manual operation as well as CNC software enables safe operation by the message function. vailable vertical and horizontal type. Quiet and smooth transversing operated by AC servo motors. Adopted specially heat-treated lead screws. 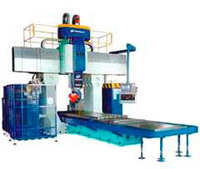 Available knee typeand bed type vertical, horizontal and universal milling machines. Easy machining large work pieces by gap style bed, adopted to all lathes. Excellent accuracy of machine, assembled by the triple-point-support style.